This is my 300th blog post and I thought I’d dedicate it to someone…a video and film artist, yoga teacher, colleague, inspiration, a box of trust (BXT) friend…a Londoner in Shanghai who I met last year during my China days…Savinder Bual. I was going to write a nostalgic post about where the year has taken me so far and what’s yet to come…but that can happen at any stage. People are and always will be the most important thing in my life. Savinder currently has work on show until the 29 March with the Balaclava Gallery…a space that I didn’t know about that is an ‘exclusively online platform dedicated to the exhibiting of contemporary artwork that only exists (or was recorded/lives on) in digital format. This can take the form of many different guises: video, photography, animation, audio, video games, digital drawings and paintings etc. It also could include photographs of work, which was made but has now been dismantled, and digital evidence of any other temporary interventions of any kind. We believe that art education is being seriously slow (if at all) in engaging with new technology and we want to challenge the conventional methods of making and showing work. We know that this is not a new idea but hope that by specifying that the work only exists in digital format, this promotes and celebrates the use of technology in contemporary art. And we think the perfect place to show this work is on an online gallery. ; no opening times, no travelling to see the work (in fact we like to think you’ll be viewing in your pyjamas) and no overheads for us for running a ‘real’ space. The gallery has programmed a series of solo exhibitions from artists responding to a global open call.’ I think this is definitely the way more spaces are now heading…and collections…to the realm of the online and digital, is exhibiting online the future of curating? I have actually discussed this before on my blog largely in relation to the DSL Collection and their work. Balaclava Gallery is one to watch in my eyes…in your pyjamas, obviously. It’s the most productive time! 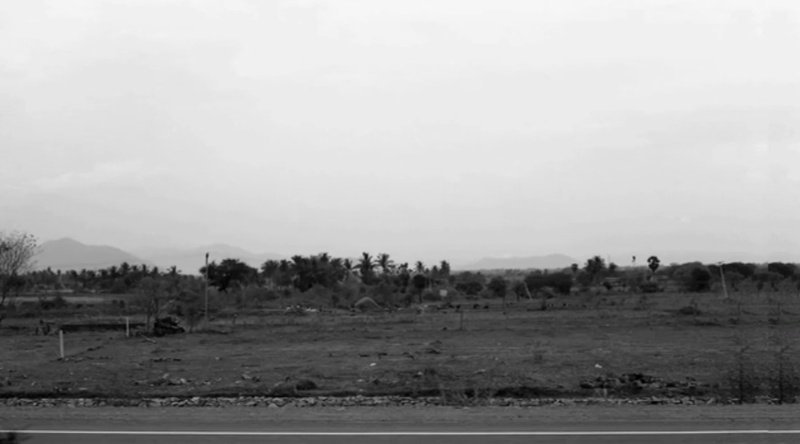 For Balaclava Gallery, Savinder is exhibiting ‘Road’ (2011), a video work that explores the notion of the still image twinned with her wonder at the illusion of the moving image. Whilst making the work, she imagines herself as an early cinema pioneer trying to make the still image move in an attempt to create hybrid works that sit between the pre-cinematic and the digital. In ‘Road’ (2011), the image stays fixed on the right hand side of the frame, then jarring, edging, flickering from right to left to a moving image of a roadside view. As you watch the film, your sense of movement is displaced through the stunted travel towards an unknown, placed in conflict with a frustrated feeling of being stuck, unable to move…almost like trying to escape a dream, or nightmare, that’s on repeat. You want the video to move, for the image to take you somewhere new…where will ‘Road’ (2011) take you? Great post Rach! Congrats on your 300 mark! Congrats to Savinder too… very interesting film. My eyes played tricks on me when watching it. It is really hard to concentrate… really interesting take on perception and reality.